The story goes like this – over a year ago, I discovered that our butcher at the time carried rabbit. Frozen, unfortunately, but as this was a relative delicacy that I have yet to see anywhere else, I just couldn’t resist the temptation to buy one. As it happened, I bought two. And they’ve been languishing in our freezer ever since, because we just never thought of a way to try cooking them that really appealed to us. Sure, I found plenty of recipes for rabbit stew and rabbit braised in wine and rabbit pies and other similar things in my online search for ideas and guidance, but we just never got to the point where any of those things seemed like something we felt like eating. A lot of this was because we felt that with a new ingredient, one that neither of us had ever had the opportunity to even try, we wanted to make something that would really feature its flavor, rather than hiding it in a soup or sapping it in a braise. Also, for awhile we honestly just forgot that we had them. But a couple of weeks ago we found ourselves dealing with some tight finances until payday, and we wanted to use up some various odds and ends that we’d been saving rather than buying a bunch of new, fresh meat. Thus, one of our little icy bunnies made it onto the menu. The inspiration? Traditional creole and cajun cuisine; namely, rabbit and sausage gumbo. I know what you’re thinking. “That doesn’t look like any gumbo I’VE ever seen.” And you’d be right. Because we didn’t really make gumbo. We deconstructed it. Deconstructed dishes tend to be sort of a trendy, high-brow sort of thing, but I think the idea has a lot of merit when thinking about single dish foods like soups, stews, baked goods, or other things that use many disparate ingredients to create a single harmonious whole. While such things can be completely delicious as they are, there is a lot of land to be explored when you consider each individual ingredient as a meal component in and of itself. When making a normal gumbo, all of the bits and pieces combine and meld to make a bowl of goodness that has a truly tasty overall flavor, but those individual ingredients lose their identity, sacrificing individuality for unity. Deconstructing this dish allows each component to shine. The rabbits themselves were packaged whole with certain organs still attached, mostly notably the kidneys. Breaking down the rabbit naturally fell to me, as I seem to have developed a bit of a knack for breaking down whole birds like chickens or turkeys. The rabbit, though, was well and truly a whole different animal. I suppose the basic structure was the same, but there were bones in odd places, and the mid-section of the animal was so lean I wasn’t even sure if the bits surrounding the rib cage were actually meat or just especially thick skin. In the end I decided upon the latter, and I ended up quartering the rabbit (front and hind quarters on both sides) and removing what I believe were the saddles (a long relatively thick muscle that nestled against the ribcage on each side), discarding the bulk of the body of the rabbit. It would be prudent to note that there is really very little meat on a rabbit, and that the bulk of it exists unsurprisingly in the hind legs. The saddles are a hidden treat, however, and are tender the way a filet of beef is tender, as it seems to be a muscle that is little-used during the rabbit’s lifetime. The skin on the quarters was left on, mostly because I found it to be a devil to remove. Each of these pieces was rubbed down with a mixture of olive oil, salt and pepper – as I said, we wanted to keep it simple so that we could really taste the meat itself. They were then roasted in the oven (I honestly can’t remember the temp. or time, its been so long since we made this… my apologies!) until they were golden brown and cooked through so that any juices than ran out when the meat was pierced were clear. Being a fairly uncommon meat and lacking in any sort of guide book for game meat, we didn’t bother monitoring internal temperature and just used our instincts to judge when it was done – they didn’t fail us, though I’d recommend anyone else who decided to give this a shot do some more thorough research than I did, just to be safe. Accompaniments for the rabbit were some sliced and sauteed andouille sausage (made by Aidells, the founder of which was one of the writers of one of the most useful cookbooks we own, The Complete Meat Cookbook), some briefly stewed and spiced red chili beans, a heaping spoonful of trinity sofrito (onions, celery, and green bell peppers sauteed together with just a bit of salt and sugar – we added some carrot as well to round out the flavor), and a bowl of cajun-spiced broth. The rabbit itself was delicious – the texture was almost exactly that of chicken, and the flavor was similar as well, but more earthy. This was a farm-raised rabbit, so I imagine that wild-caught rabbit would have a touch of gaminess to it as well, though I doubt it would ever be terribly strong. 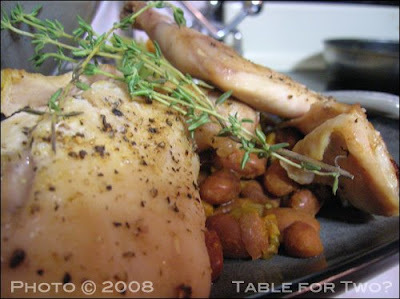 I would remove the skin next time, as it ended up a bit rubbery – we didn’t achieve the crispiness I associate with good roasted poultry, and was a trifle unpleasant to bite into – but the meat was delicious, especially closer to the bone. The true appeal of this meal was that with each bite of a single component – a slice of rabbit, or a spoonful of beans or sofrito, or a mouthful of sausage – you could taste the underlying purity of the ingredients, then chase it with a slurp of the broth and the flavors would combine in your mouth to give the distinct impression that you were, in fact, eating a bowl of gumbo. The contrast was fascinating, and great fun to eat and experience. The truth is, though, that the cajun broth was the star of this show. It was spicy, rich, highly flavorful, and yet somehow light at the same time. I could take a thermos of this broth to work with me every day for a week and it would be a satisfying lunch all on its own, though perhaps a bit of cooked brown rice and sausage on the side would round things out. The flavor was incredible though, and I immediately requested that J make some more a few days later, this time as an accompaniment to some broiled catfish. The second time it was not as good, which leads me to believe that the recipe still needs some tweaking, but the memory of the very first spoonful that flowed over my tongue will stay with me for a long time, I think. 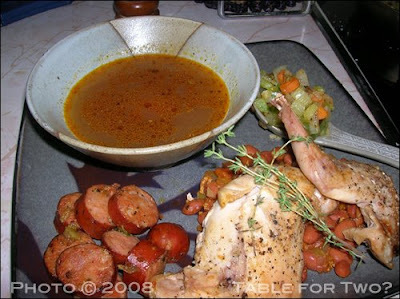 – The andouille that we ate along side the other parts of this meal actually created the base for the broth – J sauteed them in a saucepan along with maybe 1/4 cup of the trinity sofrito before removing them to eat separately with dinner. The relatively brief cooking period rendered out some of the fat and a lot of flavor, which made a huge difference to the broth in the end. – We’ve discovered that the key to really authentic-tasting cajun/creole food seems to be generous amounts of garlic, paprika, chili powder, and thyme – combined with the flavors in the holy trinity, this really seems to lay down the base for a good gumbo or jambalaya. – When in doubt, over-season. The broth was initially rather too strong when J completed it, but that was easily remedied by adding a bit of water. Making the flavors too weak at the outset, however, can require a lot of tweaking of spices later on, and it gets awfully difficult to maintain the proper balance when you’re on your third or fourth addition of the same spice. Don’t be afraid of them! This style of cooking demands the kinds of flavors that smack you in the face and leave you speechless as you try to figure out what the hell just happened, and that’s really ok. What matters is that the proper blend is achieved, and once you get that, its always easy to just thin out the final product until you reach the level of intensity that you prefer. I promise to share this recipe once we’ve gotten it down, because its just way too good to keep to ourselves. We’ve had tons of other ideas to use it, from cooking rice in it to using it to poach chicken, to thickening it with a roux made from andouille fat and flour and spooning it over steak, and I’d love to know what other people might think of! This entry was posted in Food, Drinks and Cooking, Table for Two? Archives and tagged beans, dinners, game meats, soup, vegetables. Bookmark the permalink.